Spend your Tuesday afternoon with us in the best way possible: ice cream brain freeze! Please join us for this year’s annual meet and mingle with our business partners and Alaska ALA members. Come socialize and create delicious ice cream sundaes while visiting with our members and start long lasting customer relationships. We will be accepting donations for Clare House. Items needed: full size shampoo, lotion, women’s deodorant, liquid laundry detergent, liquid softener, dryer sheets, large black trash bags, white trash bags and totes (bins with covers) or financial donations. We hope to see you all there! Please let us know if you have any questions. Thank you for your support of Alaska ALA and we look forward to an amazing year! 2017 Presidents’ Award of Excellence! 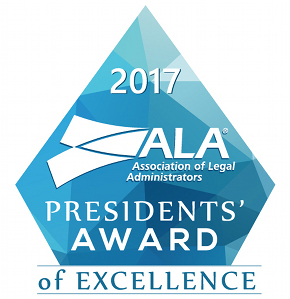 We are proud to announce that the Alaska Chapter of the ALA has received the 2017 Presidents’ Award of Excellence. This program is a performance guideline that the Alaska ALA Chapter has met in taking effective and collaborative action in support of ALA’s mission to promote and enhance the competence and professionalism of legal administrators and all members of the legal management team; to improve the quality of management in law firms and other legal service organizations; and to represent professional legal management and managers to the legal community and to the community at large. Our chapter will be receiving this recognition at the 2017 ALA Annual Conference in Denver in April.